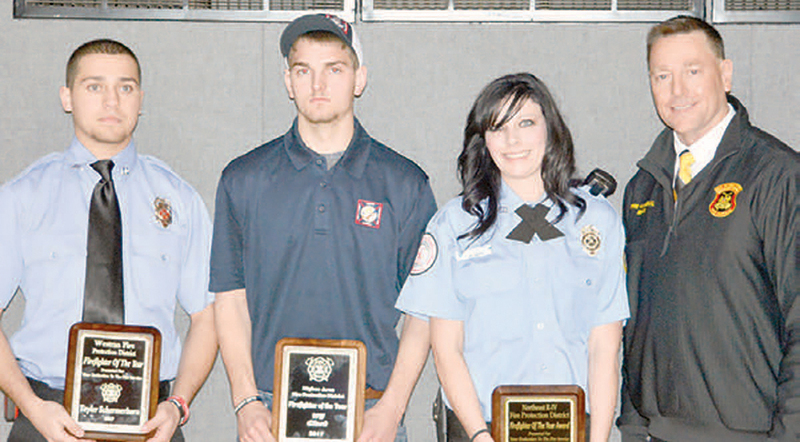 Randolph County Fire Award Dinner Held | F.F.A.M. 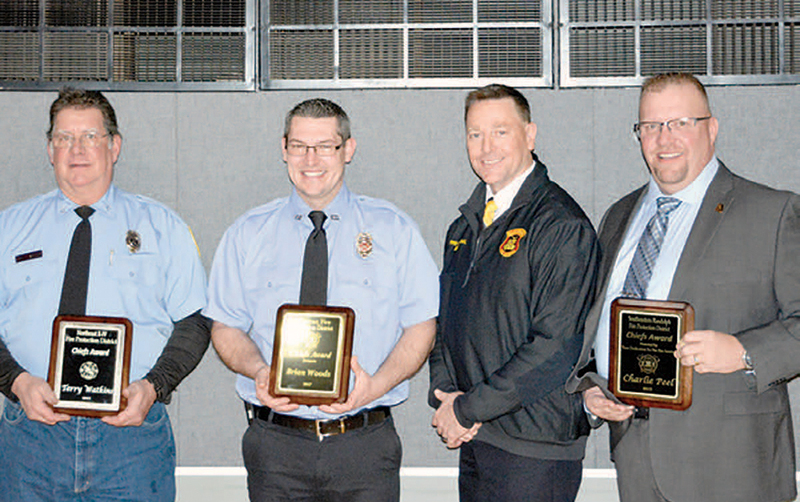 Moberly Fire Chief George Albert said while the firefighters were honored to receive the various awards, recognitions is not something they look for in the course of their duties. 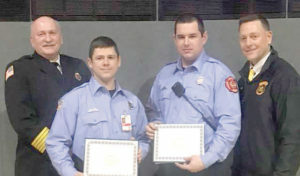 Moberly Firefighters Trevor Stein (left) and Ben Wolverton (right) receive the Life Safety Award presented by the City of Moberly and MFD. Both firefighters were involved in the September 17, search and rescue of a young female during a residential structure fire. Awards were presented to firefighters for community service, appreciation, firefighter of the year and the chief’s award. The community service award was given to firefighters who led community relations efforts and several local supporting individuals and organizations including Ricky Roberts, Ron Stuck, MFA Oil, Moberly Fire IAFF 2671, Ben Wolverton Cory Putnam, Ross Dut-ton, and Seth Truesdell. Moberly firefighters Trevor Stein and Ben Wolverton were recognized with the Life Safety Award for their efforts in the search and rescue of a young girl during a September 17, house fire in Moberly. According to reports, the firefighters entered the front of building and encountered heavy heat and smoke. They advanced to the kitchen where they approached heavy flames. Wolverton, while in the process of extinguishing the fire, was notified by Stein he found a victim and needed assistance. 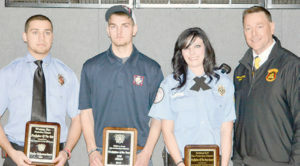 Firefighter of the Year winners pictured left to right are Westran FPD Taylor Schemerhorn, Higbee FPD Will Clark and Northeastern R-4 FPD Tasha Pettit. Pictured far right is Missouri State Fire Marshal Tim Bean. Not pictured is Southeastern FPD’s Johnathan Wolfe. Firefighters moved the patient outside where other firefighters began medical treatment until paramedics arrived. The patient suffered from second and third degree burns, and smoke inhalation. State Fire Marshall Tim Bean and State Rep. Chuck Basye (R-Rocheport) were in attendance, as was Fire-fighters Association of Missouri President Ken Hoover.